The Glacier Peak Grizzlies returned from summer camp Saturday filled with fight and vigor for the upcoming season. In addition, as tradition dictates, many of the freshmen were sporting new haircuts. It has only been 90 days since Nik Bender was named new Head Football Coach, replacing high profile Rory Rosebach, but the team is already responding favorably to the changes. 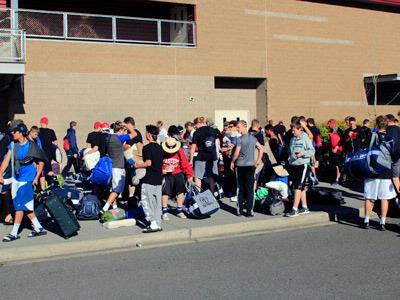 Eastern Washington University was once again, the choice, for the Grizzlies 2016 summer football camp. No one really knew how the players would respond at full speed against other seasoned programs from across the state, but in our view, it seems they will continue their winning ways without losing a step. With changes in leadership and not at full strength, Glacier Peak still managed to win most of their scrimmages. That said, they were a bit rough around the edges and at times had some communication issues. All to be expected, according to head coach Nik Bender, “I was pleased with their performance for the most part” he said. Veteran defensive coordinator, Steve Hannan, was very upbeat as usual, “I have no worries that we will get better as several players adjust to their new roles. We go through this every year and this group is no different,” Hannan said. Steve Hannan is well revered as one of the top defensive coaches in the state and once again has the luxury of a large pool of returning talent. Glacier Peak’s roster looks like a who’s who in WESCO varsity football with returning veteran starters that will make the difference in the Grizzlies move to 4A in 2016. Senior Colton Bunt DB F WR, Senior Maliki Fifita NT DL, Senior Alex Garrett LB WR, Senior Jacob Elvig DE DL, Senior Ricky Kranz LB, Senior DJ Keenan OL DL, Senior Luke Wyatt WR DB, Senior Deven Kamihara RB LB are just a few of the 33 returning seniors expected to headline the Grizzlies 2016 program. That is not including Sophomore Ayden Ziomas QB and Junior Jaxon Sweum QB RB who have shown extraordinary play making abilities and exceptional poise under pressure. 'Deep' is an understatement when speaking about the class of 2016. All is yet to be proven, but the signs are there for another great season.